I’ve been watching some of the presentations over at the SharePoint conference site and I’ve learned that Windows SharePoint Services is going to now be called SharePoint 2010 Foundation. Even though there is nothing particularly wrong with that, I think it is going to create more confusion around the different versions of SharePoint for most people. Unfortunately, it is just something we’ll have to deal with. What I have also heard (but can’t yet confirm) is that SharePoint 2010 Foundation (i.e. the new version of Windows SharePoint Services) will now install with SQL Express Edition rather than the SQL Embedded Edition. What’s the issue here? The issue is that SQL Express has a limit on any database of 4GB, while SQL Embedded doesn’t. So that means, on new installations of SharePoint 2010 Foundation your content is going to be limited to 4GB unless you use another version of SQL Server. Again, I have only read about this limitation and can’t confirm it fully until I actually get my hands on the beta (which is due out this month). I will be very interested to see what SharePoint 2010 Foundation incorporates and whether it will operate on SBS 2008. Stay tuned here for updates. For the month of November, if you subscribe to my Windows SharePoint Operations Guide (www.wssops.com) you’ll receive 60 minutes of free remote support time to use in any way you want. You could use it for in house training or client demonstrations, it doesn’t matter it’s up to you how you choose to use it. – Over 1,500 pages of technical information on Windows SharePoint. As I have recently announced, the Windows SharePoint Operations Guide will be expanding to include areas much as Microsoft Office SharePoint Server (MOSS) and Business Productivity Online Suite (BPOS). It will also start shortly including information about the soon to be released SharePoint 2010, so if you need information about SharePoint than look no further than the Windows SharePoint Operations Guide. For more information about the Windows SharePoint Operations Guide visit the web site www.wssops.com or send me an email (director@ciaops.com). Let me save you a lot of pain. From everything that I have found to this point, Search Server Express CANNOT be installed on SBS 2008. I have tried to get it working many, many different ways and have never had any success. I have asked Microsoft support how to get it working and they couldn’t help. I had some highly regarded contacts in the SBS community attempt to get answers from Microsoft as well but to no avail. How can this be? 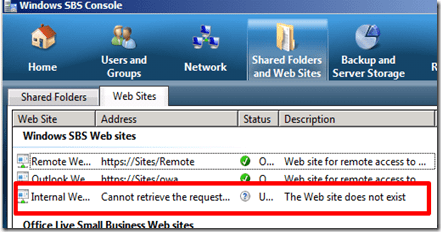 Search Server Express is built on SharePoint technology and would make a fantastic addition to an SBS 2008 server yet it won’t install and worse, when you attempt to uninstall it after a failed installation, it blows up the existing SharePoint installation. How can this be? Search Server Express works fine in a stand alone installation but yet on SBS 2008 it all goes pear shaped. So rather than go through the misery yourself here’s what happens. 1. You install Search Server Express on SBS 2008 and everything look sweet until the SharePoint Products and Technology Configuration Wizard runs. At about step 6 you get the following nasty error. 2. Realizing the error of you ways you go into Control Panel and remove Search Server Express. Indicating no web sites there at all. Which means that uninstalling Search Server Express has effectively uninstalled SharePoint from your SBS 2008 system! 6. This now means you have to get SharePoint back and working. 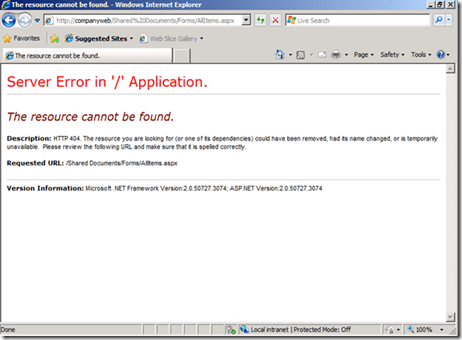 Now it becomes a question of can you restore SharePoint? How was SharePoint being backed up? 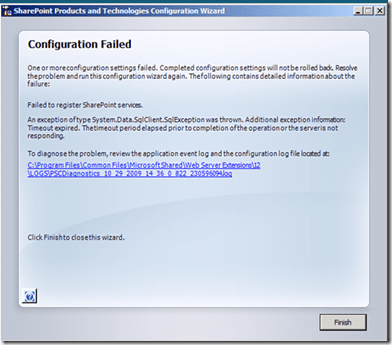 What method are you going to use to restore SharePoint to where it was before you attempted installing Search Server Express? I can tell you that you are in for some fun and games if you aren’t prepared for it. So why doesn’t Search Server Express work on SBS 2008? I don’t know. 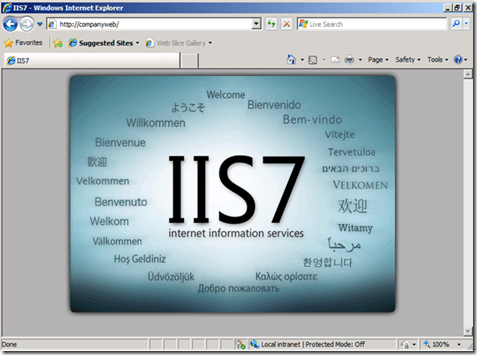 Why doesn’t Microsoft provide some guidance on install Search Server Express on SBS 2008? I don’t now either. All I know is don’t try to install Search Server Express on SBS 2008 because you’ll end up in a world of pain. I’m still working on a solution and when I find it I’ll let you know. Well I’ve finally gotten myself signed up to Google Wave to see what it is all about. Unfortunately, I don’t know anyone else who might be interested in joining me in a ‘Wave’ and learning what’s it all about. It’s kinda like email with out anyone to send to. So if you have a Google Wave account and would like to collaborate with me on understanding the implications Google Wave may have I’d love to hear from you (in Google Wave) of course. You should be able to connect with me on Google Wave via ciaopsdirector@googlewave.com. If you do connect it’s probably also a good idea to send me an normal email (director@ciaops.com) so I know that we should be connected. If Google Wave does take off I see it having implications for for many technologies we currently have, email, blogs but also perhaps SharePoint as Google Wave represents a collaboration platform. That’s why I’m so interested to understand exactly not only how it works but also how well it works. From what I’ve seen so far Google Wave has the potential to be a pretty game changing technology if it gets adopted and that is a big if. Why? Because even though people are using technology they have become so comfortable with the technology they use everyday, like email that making a major change to something like Google Wave will have to jump some major non technical hurdles in its bid for adoption. However, if it does manage to become widely adopted it will almost certainly be a major game changer. If you don’t know much about Google Wave I suggest you visit the web site and watch the video presentation (warning, it’s long). After you have watched the video I’d love to hear your thoughts on you opinions on what ramifications it would have. So if you have a Google Wave account I’d really love to hear from you even if you have an opinion about Google Wave then I’d also love to hear from you. “By taming the overflow of information across systems and technologies, SharePoint enables organizations to thrive,” (Steve) Ballmer said. I certainly believe that the SharePoint 2010 will continue this growth, especially given SharePoint’s ability to be deployed via the cloud through solutions like Microsoft Business Productivity Online Suite (BPOS). I see it as a major opportunity to provide solutions to businesses not only in my local region but all around the world. So it all sounds great but I’ll wait and see what the beta is like before I make any final judgement because there are number of things I’d like to see whether they have rectified and what new ‘features’ they have included. As soon as I have the beta up and running I’ll post my observations here. So stay tuned, not long to wait now. Now I reckon that the toughest job in the world is customer service, which most people are in these days. I’ve had a few experiences in the last couple of days that have made me think about the way that I deliver customer service. Let me give you some examples. A few times recently I’ve needed to go and ask for information at an enquiry location. Every time, I have left with the information I needed but also that I was a bit of an idiot for asking. Another time I had a misunderstanding about something I had bought and again got it sorted but felt after the experience that it was my fault for not knowing the full ‘in’s’ and out’s’ of something I’d only just acquired. Finally, when I ordered something, I came away with my order but felt like I was being such a burden. I understand that in many of these circumstances the individuals I interacted with deal with perhaps hundreds of people each and everyday. I’ll also bet that the vast majority of people they deal with can be pretty demanding. This constant battering makes it extremely hard to maintain a sunny disposition and helpful attitude in every single case. Given the pressures of constantly dealing with people wanting something (in many times immediately) I totally understand why they have lost that twinkle in their eye. However, I do see two opportunities here. Firstly, if the level of ‘customer service’ has generally fallen to a mild level of distain then it opens the door of opportunity for an elevated level of customer service. I can’t help but think of how much better my experiences would have been if the people I had dealing with really let me know that they wanted to help me. If just one person had taken the time to exercise an enhanced level of customer services it would have stood out like a beacon in recent times. Now don’t get me wrong, I fully appreciate that maintaining this level day in and day out is hard but imagine the opportunity if you could even just lift the level above the current level? You’d really make a mark I reckon. Secondly, as a consumer how much more of an impact am I going to have on someone providing me with a service if I at least do my best to make their job easier. The chances of it making an impact are probably pretty small given the general poor behaviour of consumers but again, there is a chance that because it is an above the normal response some benefit maybe forth coming. Now, if you think that odds of either would make a difference consider all the people who play the lottery each week in the hope of it changing their lives in one fell swoop. I reckon that if you adopted what I suggested above then I’m sure your chances would be much better than playign the lottery and would increase everyday. Now perhaps the thorniest question is how do you keep your levels of customer service up when you are being ‘battered’ everyday? I suppose the best suggestion I can make is that you need something outside the field you are working in that can give you a break and allow you to ‘refresh’ yourself. For me this means something totally away from IT, which I admit is very hard, but honestly when I have managed to take that ‘complete’ break I feel my energy levels renewed and am ready to accept the challenge of the hardest customer request. As I have said before in this blog, it is all about finding a balance. The strange thing perhaps to grasp is that to provide better customer service you should be doing ‘less’ of what you normally do and ‘more’ of what you don’t normally do, because typically most driven people mistakenly believe they need to keep doing more and more of the one thing. The problem is that the incremental return of more and more becomes pretty small after a while. Better off to take a break to promote the energy to take it to the next level. So there you have it. From what I have seen lately, there is a huge opportunity to distinguish yourself and your business by providing an increased level of customer service. The way to achieve that is to actually take more time completely away and refresh yourself. Very Zen if I do say so myself. It would seem counter intuitive, I know, but I would content that the road to success is about doing less rather than doing more. Truly successful people determine what they are best at and they do it. Other stuff they are not good at they either stop doing it or get someone else to do it for them. Another step in this process is that they also automate as much as they can to free their time for the stuff that is important. So many people I know believe that they need to keep doing more when in fact they are actually only creating more distractions for themselves. We all have the same amount of time allotted to us yet they way we chose to utilize that says a lot about our attitude towards the value of our time. People who don’t value their time want to cram more and more into their program which has a limit beyond which actually reduces available time. An great analogy I heard once is that you ‘can only fit so much on your dance card’ so choose wisely because you’ll never get that time back again. Take a look at what you are doing. Are you trying to do more and more? Are you taking of everything you can to leverage more time? Are there others you can work with who can assist you freeing up your time for what you are best at? To me it makes fare more sense to build a network of trusted partners who can work with you to cover your ‘non-core’ areas. This would allow you to focus more on the things you are good at while still maintaining ‘coverage’ of those other areas. How do you find such partners? Good old networking. Not just the latest social networking but the good old fashion networking of meeting people face to face. In my opinion one of the most important assets that any individual has is their extended network. My question to you is – what are you doing to develop your network? The honest answer from most people is that they are doing nothing. Rather that working more intelligently by finding people whom they can work with and share their load they have this mistaken belief that they can do it all. Sooner or later these people get crushed under the load they subject themselves to. Like any asset a network of contacts needs to be developed and maintained. Technology makes it much easier but it doesn’t overcome the necessity of work in this respect. Don’t also be fooled by the amount of false networking that happens with technology. Most of today’s social networking is about getting more followers or friends. It is not about this at all. Good networking is what it has always been about, developing lasting relationships that can support you and investing in them. My question again is – what are you doing to invest in these networks? Because if you aren’t investing in your networks then you are doomed to crush yourself under a never ending mountain of obligation. Long live the Tribe – is what I say now after considering things of late. Why do I say this? I now see ‘community’ as merely something to belong to. It requires little effort apart from claiming ‘you belong’. There is no requirement to participate, there is no requirement to contribute. It seems that many people who consider themselves part of a ‘community’ in fact simply view it as an opportunity to receive. Conversely, I see a ‘tribe’ as something that requires active participation. I see it as something that involves sharing skills and abilities in a way that benefits all. In short it not only requires active membership but also active participation. The strength of the tribe comes from the skills and contributions of its members, where the perceived strength of a ‘community’ merely comes from its size. To me a ‘tribe’ is far more focused than the broad base that a ‘community’ seems to refer to. After some recent interactions with the ‘SBS community’ I now really believe that it has become fare too broad to accommodate all the members it has. Although many believe it is this size that makes it strong I would actually content that it is exactly this size that it weakening it, making it harder to provide direction and reach consensus. I would also contend that a major difference between a ‘tribe’ and a ‘community’ is that a ‘tribe’ is lead while a ‘community’ is merely about following. It seems to me that the ‘SBS community’ is struggling with this very issue. Although there are plenty of willing members, there seems to be very few who are actually prepared to lead, to forge a direction (even if it is incorrect) and generally move with the times. Instead there seems to be a never ending battle to achieve consensus in a ‘community’ that is now far too diverse to possibly achieve this. Recently I was looking for an opportunity to meet with members of the ‘SBS community’ in the UK. I sent numerous emails to ‘key’ individuals seeking simply to have a chat about the SMB business in the UK. Although I was happy enough just to chat I would have also been happy enough to share my SharePoint experience as a contribution for the commitment people might make. I was disappointed to find that only 2 individuals took up this opportunity to meet with me. Both of these individuals put themselves out to meet me in a place convenient to me not them and for that I have nothing but thanks and appreciation. Happily I can say that these two meetings were more than worthwhile from my point of view and will provide a positive impact for my business going forward. I certainly hope that I was able to oblige them with something in return. I have nothing against the concept of ‘community’ per se, but I believe that it just isn’t relevant any more because it is too broad. My aim is to seek out successful ‘tribes’ and join them by actively contributing to their goals and members. I am disappointed that many people still wish to remain part of a ‘community’ but I am glad that a few see the benefits of making a contribution beyond this into becoming a ‘tribe’.